The Tenth Annual Orthopaedic Associates of St. Augustine Golf Tournament was held on Wednesday, October 10th at the St. Johns Golf and Country Club. 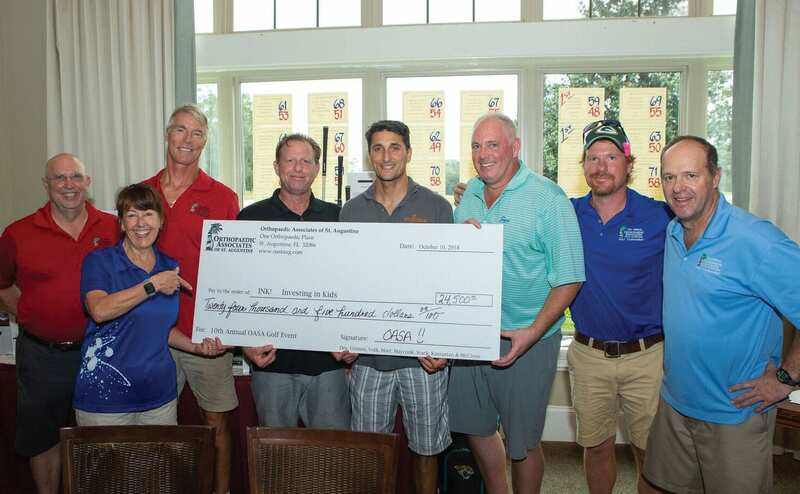 The tournament, which welcomed 100 golfers, raised over $24,000 to benefit Investing in Kids. Investing in Kids (INK!) provides innovative programs and classroom resources to further the success of our public school students. Donna Lueders, Executive Director of Investing in Kids, was on hand to accept the check donation at a luncheon held in the clubhouse after the event, which was emceed by Action News Jax Sports Director Brent Martineau. ORTHOPAEDIC ASSOCIATES OF ST. AUGUSTINE PHYSICIANS PRESENT DONATION CHECK TO DONNA LUEDERS, EXECUTIVE DIRECTOR OF INVESTING IN KIDS. FROM LEFT TO RIGHT: DR. JOHN STARK, DONNA LUEDERS, DR. JAMES GRIMES, DR. BRIAN HAYCOOK, DR. SINA KASRAEIAN, DR. KURTIS HORT, DR. CASEY MCCLONE AND DR. ALBERT VOLK. Dr. Kurtis Hort, a physician partner at Orthopaedic Associates of St. Augustine, commented, “Thank you to all of our sponsors, as without you none of this would be possible. This event is truly a dream come true for me, and I am proud to say that, as of this year, we have raised over $250,000 for local St. Johns County charities.” Top event sponsors included Florida Elite Soccer Academy, Brooks Rehabilitation, Flagler Hospital, Kasraeian Urology, and WW Gay. Hole-in-one sponsors included Bozard Ford, who donated two cars, and Underwood Jewelers, who donated a Rolex Watch.